Practicing over the Winter time, we have all tried at one stage some succeeding more than others. This is due to a number of factors, Mental toughness to continue the golfing season from a summer long game into a winter long struggle. Some people just can't see the benefit of winter practice and some can. 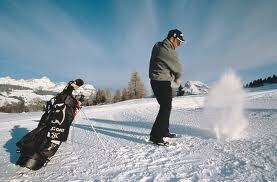 The winter is tough for golfing lover's especially ones who are living in colder parts of the world. Their's one huge factor that comes into winter practice and the need for it in my opinion. If you have ever broken a part of your body that prevented you from playing golf you know how difficult it is to get back to the level you were at before the break. The winter time is effectively September to early February so five months in all. If you as a golfer do not stay in touch with the practice range or your golf courses' putting green you will definitely find it difficult to get your touch back again. This is the main thing I believe why there is a need for winter practice, just to stay in touch. But what about when the ranges are closed or the course facilities have been abandoned due to unplayable weather, what will you do that day? Any Ideas? No? Well don't worry I have some. The Good Ole trusty putting practice. This is as you would imagine, putting practice. More working on your posture and stroke than actually mentally getting the ball in the hole. This practice method requires a putter of users preference, A golf ball and a wall. *Stand with your head placed on the wall, go into a putting posture with your crown of your head still on the wall and place a golf ball under your left eye. Drop the ball vertically downwards from under your eye and be sure to note where it falls. From now on, this is where your ball goes when putting. Grab your putter and hold the toe of the putter an inch or two away from the board, now swing the putter with your shoulders and watch your stroke and posture improve with every movement. *Do side to side push up's 10 reps. Do as quick or slow as you like, It's not how fast you can do it, it's if you did it. *Then Dumbbell fly's, These are done with a dumbbell in each hand (any manageable weight) lay on your back and flatten out your arms. Then pull your arms up and over your head. 10 reps.
*With the same dumbbells do 10 reps of bent arm side laterals. 10 dumbbell front raises (to ceiling) Your going to really feel it now! *And finish off with 10 reps of dumbbell good morning's. Check all these exercise's on YouTube. And the most important thing to do for winter training is to watch what you eat. Physical health makes such a difference to your confidence come Summer time and this will definitely leak into your golf game. Stay healthy guys! !